I think these are the BEST Snickerdoodle Cookies I have ever made. 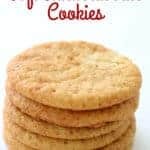 They are soft, chewy, and thicker then your average snickerdoodle recipe. Perfect for Christmas or in a lunchbox. Leave eggs sitting at room temperature for about 30 minutes. Mix butter, 1 cup sugar, brown sugar and eggs thoroughly in a large bowl. Inn a separate bowl, whisk together flour, cream of tartar, baking soda and salt. Slowly add dry ingredients into butter mixture. Do not overmix. Chill an ungreased baking sheet for 15 minutes. In a small flat bowl, mix together remaining 3 tablespoons of sugar and the cinnamon. Form dough into shape of roughly of 1 1/2 "Tater Tot"
Gently roll into the cinnamon sugar. Place on end onto prepared baking sheet, and bake 9-11 minutes.